Successfully Added 7 Inch Android 2.2 Tablet with WiFi and Camera (Christmas Edition) to your Shopping Cart. 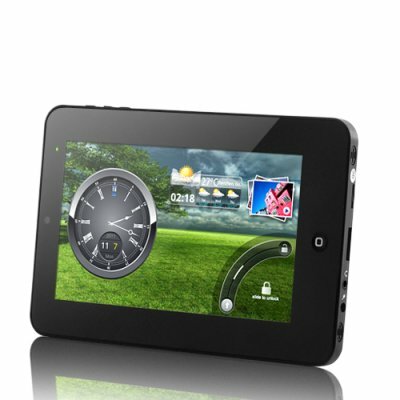 Available in our warehouse now, this 7 Inch Android Tablet is ready for immediate shipment to you or your customer. Guaranteed to be the next hot item in your online store, and perfect as a Christmas gift to your beloved ones, order now before everyone has one and make a nice profit for yourself! Brought to you by Chinavasion, the leader in wholesale consumer electronics. One good item, thank you again Chinavasion. I wasn't expecting such a great product! I thought the tablet wouldn't support multitouch, I thought that the touchscreen would be bad quality and that it wouldn't have accelerometer, but it does have everything, it supports multitouch, the touchscreen is very responsive and it HAS an accelerometer! I bought this to show the work I do to my clients, and it has been the best inversion I've ever made, this product makes a WOW effect on people. My friends and family already want one for them too. I was expecting it to be an average tablet and I received a premium tablet with great features! thank you Chinavasion, you guys are the best!